The Marseille P Shape Bathroom Suite is a great purchase for those who's decorating their bathroom from scratch but have absolutely no idea where to start! The suite includes 8 beautifully modern bathroom fitting and features, so you can have the contemporary bathroom of your dreams in no time at all! The Marseille wash basin is the perfect combination or smooth, sweeping curves and long, straight edges. It provides you with more than enough space for general day to day use and works brilliantly in any bathroom environment. It’s not just great aesthetics either, the wash basin will come with a pre-drilled tap hole so you won’t need to worry about drilling one yourself. 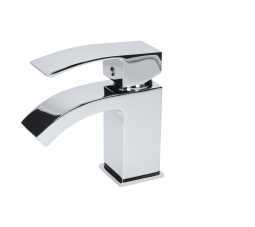 These are designed specifically for use with a basin mixer to continue the minimalistic styling. Vitreous china is used in the basins manufacturing process because it’s not only durable but simple to finish in a high gloss white. It’ll look crisp and shiny anywhere it’s installed, and it’ll be easy to wipe clean. To keep the basin positioned correctly it’ll be fitted to a beautiful, slender floor standing pedestal. They look good and do a fantastic job of hiding any pipework. This Marseille bathroom set is the perfect suite to complete your bathroom as it supplies you with everything you need for an ultra modern and stylish finish! Supplied with our P-shaped shower bath which can be right or left hand to suit you and your bathroom this suite is completely versatile and practical. All products in this set are made from high quality materials and with a fantastic guarantee on all, this should not be missed!